Backed by Enterprise Singapore, NAMIC serves to develop AM manufacturing standards in order to support local manufacturing industry. 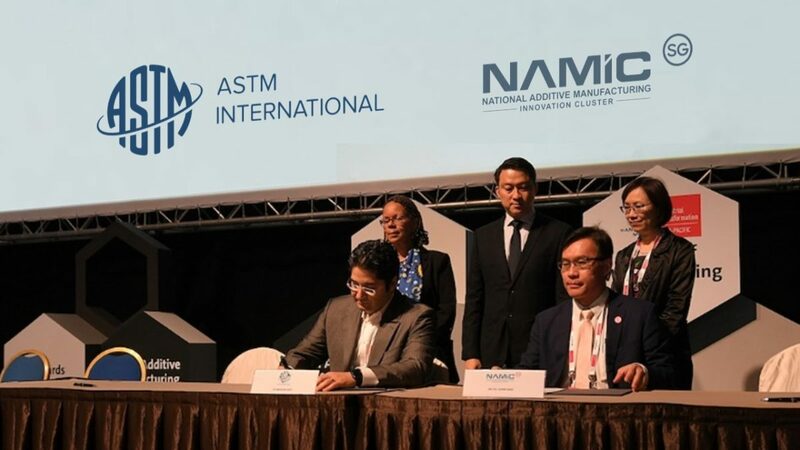 NAMIC’s partnership with ASTM International is the first in Asia, supporting R&D and standardization activities that will help drive commercialization of cutting-edge additive manufacturing technologies in Singapore’s leading sectors such as aerospace, maritime and offshore, as well as logistics and fabrication. Dr Ho Chaw Sing, NAMIC’s managing director and Dr Mohsen Seifi, ASTM International’s director of global additive manufacturing programs, signed a Strategic Partnership Agreement on 17 Oct 2018 at NAMIC’s Global AM Summit. The signing was witnessed by Dr Lam Pin Min, Singapore’s senior minister of state for health and transport and Ms Choy Sauw Kook, Assistant Chief Executive & Director-General, Quality & Excellence, Enterprise Singapore.